Beside a wide range of lessons in dressage and jumping, beach rides from one up to six hours depending on the riders experience. cross-country jumping, fox hunting (drag hunt). 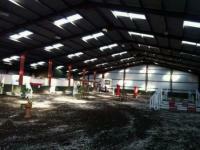 Markree Riding Stables is a truly fabulous equestrian centre, it's why we call it home. English Language Tuition - Oakwood Stables - Riding Holidays for Children in Co. Wicklow, Ireland!